We all want to be happy in life but it seems sometimes (or for some people a lot of the time) that things get in the way of their happiness, or life circumstances cause pain or illness and we then find it hard to smile. Through our evolution and with the help of sciences like Yoga we now understand that our external experiences are very closely related to how we think and feel and what our beliefs are. Infact it can be said that our life is a mirror of ourselves, for a lot of us this is hard to believe. Yoga teaches us to look within so we can understand ourselves better which then helps us to overcome our inner difficulties and troubles. The biggest difference between western and eastern cultures is that western doctors and scientists do not acknowledge the energy system of the body. In Yoga and Chinese Medicine, we refer to this as the life force energy known as Prana (Yoga) or Chi (Chinese). Prana is the universal principle of energy or force. It is vital force. It is all pervading. It is said this force that pulsates through your body and nerves is not different from the force which vibrates through the universe. The practices of Yoga work very much on the energy body by purifying and strengthening us. On the flip side when our pranic body is stagnate or blocked then we experience illness and disease. The other great benefit of understanding Prana is it allows us to move to the more subtler layers of our being. Yoga advocates creating balance in life which translates to outer and inner balance and harmony. 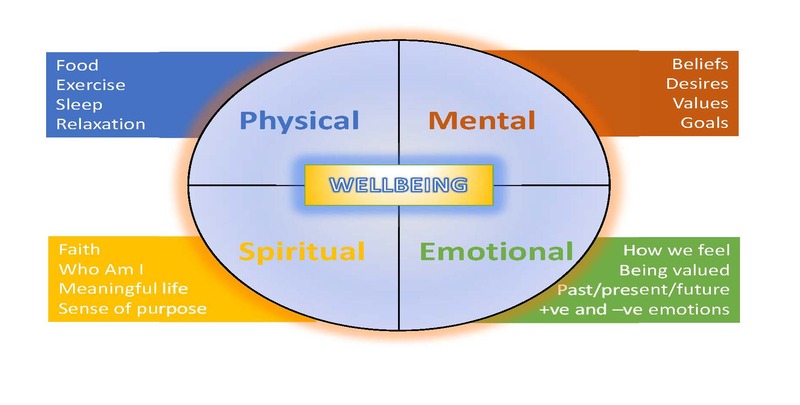 There is a system used by holistic healers worldwide known as the 4 QUADRANTS OF HEALING which is illustrated below (Depak Chopra explains this very well – follow this link for more info). If you experience difficulty on a physical, emotional or mental level e.g. chronic illness, cancer, anxiety, depression, sadness, anger etc. then understanding the 4 quadrants will help bring balance and good health back into your life. When improvements can be made in the different quadrants then there will be an overall improvement in the person’s health and well-being. This doesn’t have to happen all at once, generally the physical body is an important starting point for most people. Matt uses this philosophy and the teachings of Yoga and Ayurveda to help people restore health and improve their well being. If you want to know more, or how this may help you then please do not hesitate to contact Matt.